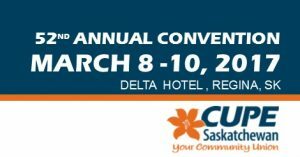 Delegates representing CUPE locals from across the province will gather in Regina on March 8 – 10, 2017, for the Annual Convention of CUPE Saskatchewan. 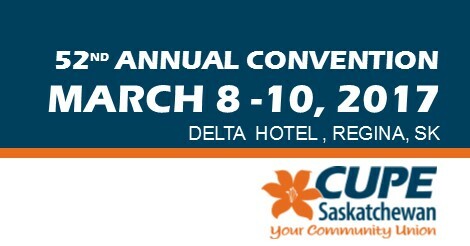 During the three-day convention, delegates will set the direction for the year ahead, elect members to leadership positions, approve financial statements, hear reports about the work being done by our union and engage in discussions about issues facing CUPE members and the public services we provide. All events will be held at the Delta Hotel (1919 Saskatchewan Drive, Regina, SK) unless otherwise indicated. The Annual Convention will Call to Order at 9:00 a.m. on March 8, 2017. **ELECTION NOTICE: Please note an additional By-Election will be held March 10, 2017. Standing Committee By-Elections will be held for the Environment Committee and the Committee Against Racism and Discrimination. One (1) member only; one (1) year term to fill position vacancies.